Here can be found product images with dates of production, exploded views of hub internals showing part numbers ,service manuals and catalogues. It is listed in order of first production date or when issued and is split by period. Henry Sturmey was also editor of a cycling magazine and so ,from the beginning, Sturmey-Archer always saw the benefit of advertising. Many of the advertisements are no longer politically correct but reflect thinking at that time. Motor cycles were a booming industry in the early part of the 20th century and various types of engines and gearboxes were then produced. There was even a production unit in Germany and later, engines were supplied for lawn-mowers and small tractors. Here can be found general company information, sales catalogues, prices and bike pictures through the years, newspaper articles, production information and factory views. There is even a contribution from England’s then national poet. 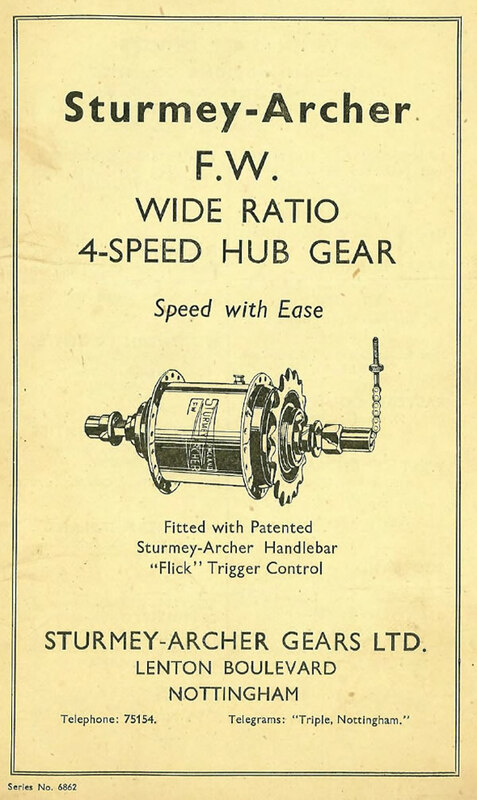 The current range of products can be viewed on www.sturmey-archer.com.